Charming necklace by Shlomit Ofir Jewelry has a large butterfly finished in verdigris on an oxidized brass chain with a brass dragonfly accent. Shlomit Ofir, an Israeli jewelry designer, is inspired by nature and often incorporates birds, leaves, flowers, and other nature elements into the design of her fine handmade gold and silver-plated jewelry. Butterflies are the motif of this striking necklace. 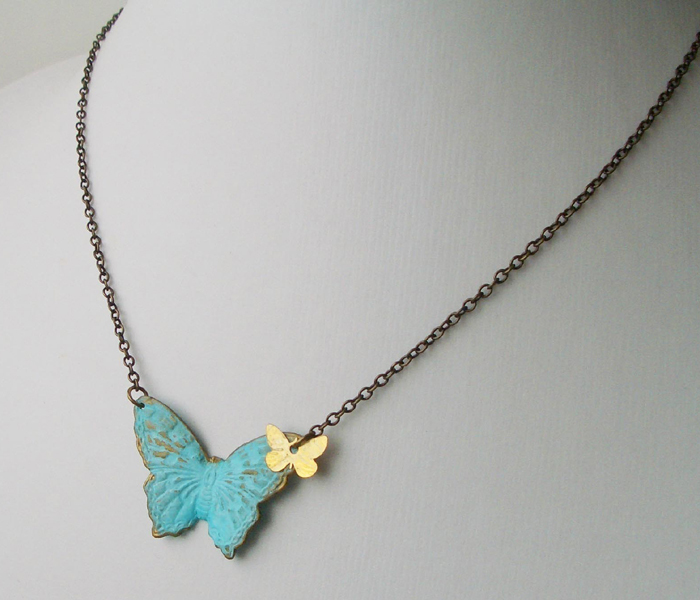 A single butterfly is suspended from an oxidized brass chain, whose earthy color recalls the shade of a twig or branch. The butterfly itself is hand-finished in verdigris, a naturally occurring green tinge acquired by copper or brass. 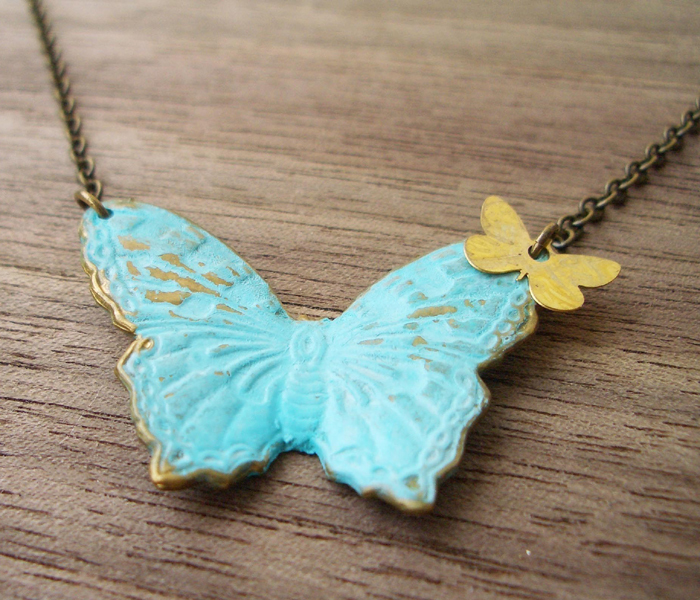 The verdigris finish gives this butterfly necklace an unusual look. The larger butterfly element is accented by a smaller dragonfly charm in brass. The muted tone of the oxidized brass chain, worked in a simple round link style, the delicate blue-green hue of the finish on the large butterfly pendant, and the sparkle of the brass dragonfly make this a one-of-a-kind update to the classic butterfly necklace. The butterfly measures 1.4 inch X 1 inch (3.5 X 2.5 cm), and the chain is 17.6 inch (45 cm) in length. Designer Shlomit Ofir's pieces will appeal to lovers of nature jewelry and handcrafted jewelry in gold and silver plate, accented with a variety of other metals. Ofir's jewelry can be dressed up or down and worn at any age. Her pieces make great gifts for anyone with an eye for quality handmade design.